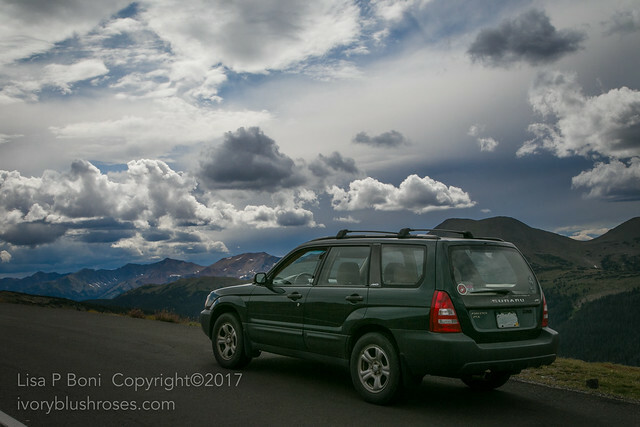 Trusty is my 2004 Subaru Forester. Up until Trusty, my luck with cars was rather abysmal and I was left stuck on the side of the road more times than I care to count. Trusty gained her name by being incredibly reliable for the past 14 years and over 200,000 miles! Not once has she left me stranded! I think I've spent more time in her than I've spent in my various homes over those same years! We've been on so many adventures together and travelled back and forth between wherever I was living at the time and Colorado. But time and age takes its toll and though Trusty still looks pretty good for her age, she is showing signs that she might not be so trusty in the near future. Her bearings and joints are creaking, she overheats a little now, the belts are stretched and loose and various little things have been coming undone over the past few months. At first I hoped to repair her and keep driving her, but suddenly the list of things needing repair grew beyond a reasonable budget for an old car. So along with all the other changes in my life, it's time to say goodbye to Trusty and God willing, next week will bring a new vehicle into my life. I can only hope and pray it will be as wonderful as Trusty has been! With the need for a couple of days of R&R, we headed for the hills for one last adventure together. It's only a car, but I find I'm feeling rather sentimental over knowing that this is our last trip together. 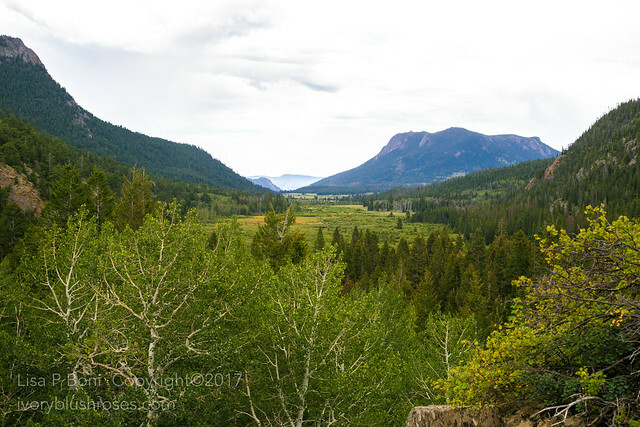 We started off with an old favorite ~ Old Fall River Road in Rocky Mountain National Park. 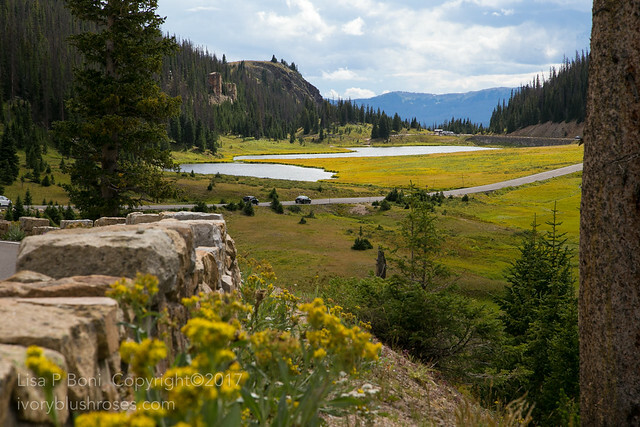 With lovely vistas of the valley below, the road winds up a canyon and exits at the Alpine Visitor Center around 11,000 feet in altitude. 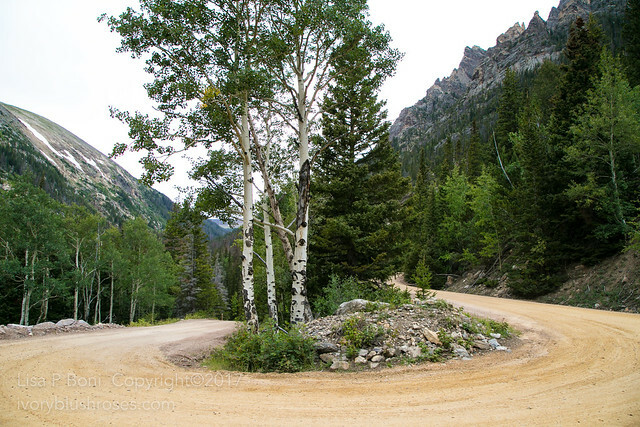 hairpin turns on the dirt road (and some pretty big ruts in places!). 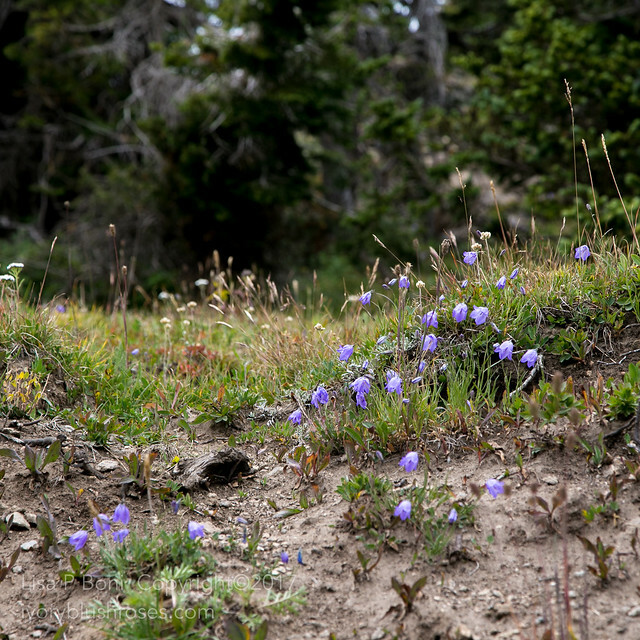 Despite the rapidly changing seasons in the mountains, there are still lovely wildflowers to be seen along the roadside. We also explored a spot I don't recall having ever been to before in Rocky. This is Lake Irene. It's a short walk away from a lovely picnic spot. 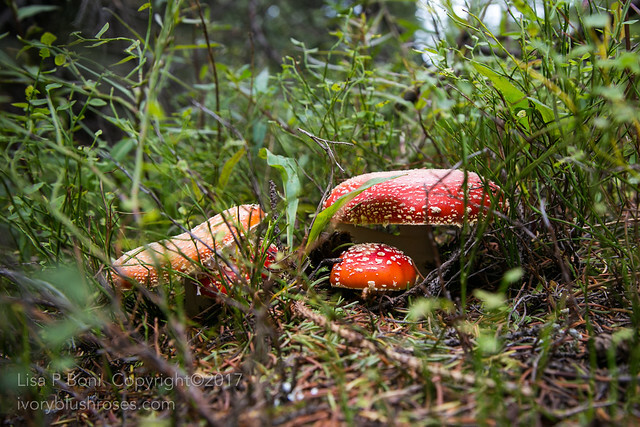 The Fly Amanita mushrooms were out! Poisonous for humans, they don't seem to bother the chipmunks. 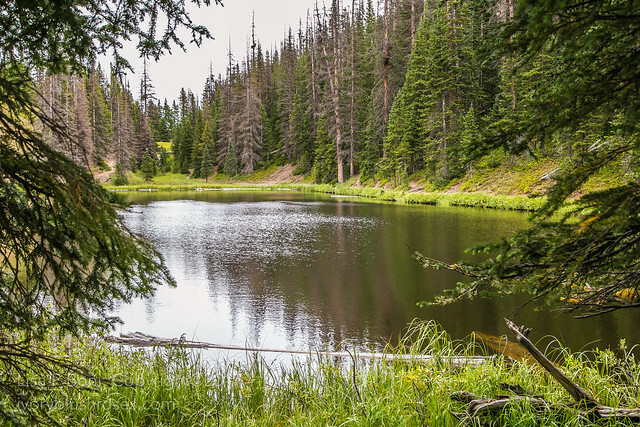 We enjoyed the drive over to Milner Pass and this lovely view of Poudre Lake which straddles the Continental Divide. 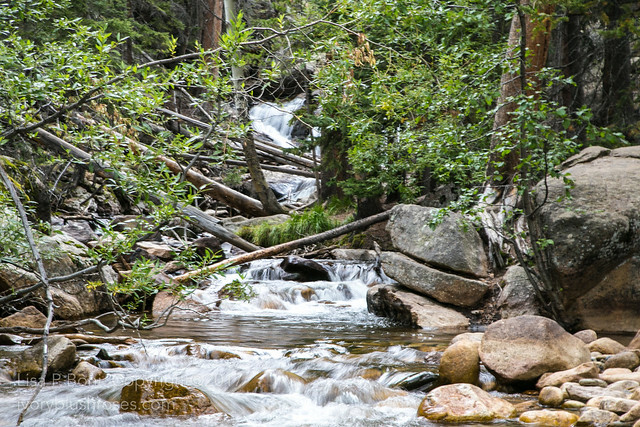 The water closest in this photo flows to the Gulf of Mexico while the water furthest away flows into the Colorado River and on towards the Pacific. We ended our first day with a drive through another favorite spot, Moraine Park. 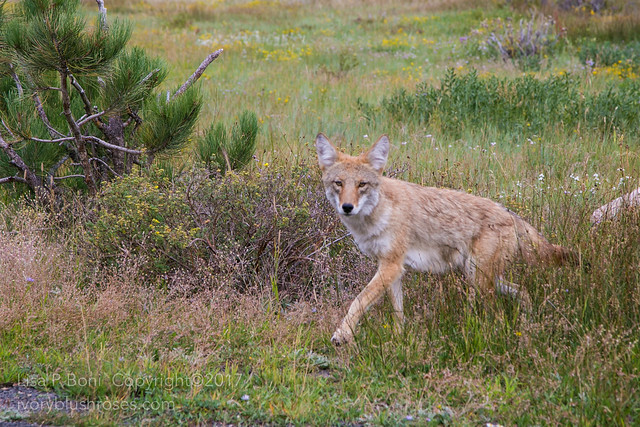 Usually the meadow is full of elk, but today, the only wildlife sighting was this coyote who crossed the road right next to me. Then he decided to follow Trusty for a little bit. When we would stop, so would he. 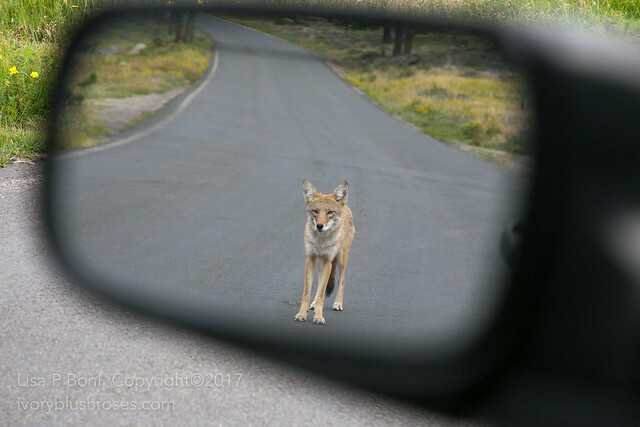 When we drove on, he followed! After about a ¼ mile, he decided to pass us and loped on by! What a treat to end our day with! What a wonderful last trip with Trusty! Just beautiful and to have that coyote experience to end it all, WOW. Lisa, I haven't left comments much for your blog though I've always been a regular visitor to your blog and a eager fan. I've been deeply respecting your attitude to the life. I always love your elegant stitches, crazy quilted works and your other works very much, best of all than others because of its pure beauties, maybe its spiritual simplicities. I really respect your courageousness for your future life. I've recognized your favorite books are the same with mine. I am the first translator of "I Capture the Castle" by Dodie Smith in Japan. Lisa, I wish you a good luck with your future. I wish you would come to Japan some time and we could meet together again. See you! I hope your happy future. Sounds like you and Trusty have lived some good life together! Friends come in all forms. Best of luck in your new car, your new home, your new life and wishing you wonderful new adventures coming in your future!